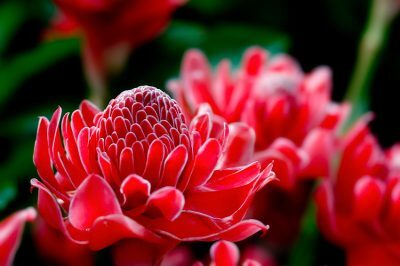 The objective of this research was to study effect of the ratio between Torch Ginger petals and tea brewing on the polyphenols content, ascorbic acid content, anthocyanin content, and the antioxidant content and consumer acceptance of Torch Ginger Tea. This experimental was used Torch Ginger dried petals to homogenized with a blender and packaged 2 and 5 grams in the tea sachet. The Torch Ginger tea brewing with water at 100 ° C and time at 5 and 10 minutes. The results showed 5 grams of Torch Ginger tea brewing for 10 minutes had the significantly highest the polyphenols content, ascorbic acid content, anthocyanin content, antioxidant content and consumer acceptance were 202.56 mg GAE/100 g dry weight, 59.54 mg/100g dry weight, 0.89 mg/100g dry weight and 667.26 μM TE/g dry weight respectively. The results of consumer acceptance showed that 5 grams of Torch Ginger tea brewing for 5 and 10 minutes were the most acceptance that accepted of color and odor, 5 grams of Torch Ginger tea brewing for 5 and 10 minutes and 2 grams of Torch Ginger tea brewing for 10 minutes had the significantly highest overall liking score. However all treatment of Torch Ginger tea were quite a few scores and no significantly different on acceptance taste score. So the researcher recommend adding honey and sugar before consuming to taste better.